Remember to contact members of Congress about the effects of ACA repeal on your hospital. The Congressional Budget Office released its analysis below. Resources are available on MHAnet. This week is National Patient Safety Week, and today, MHA is featuring patient safety endeavors at Mercy Hospital Jefferson. Mercy Hospital Jefferson understands that patient safety should be a focus year-round, not just during NPSW — much like baseball players train year-round. 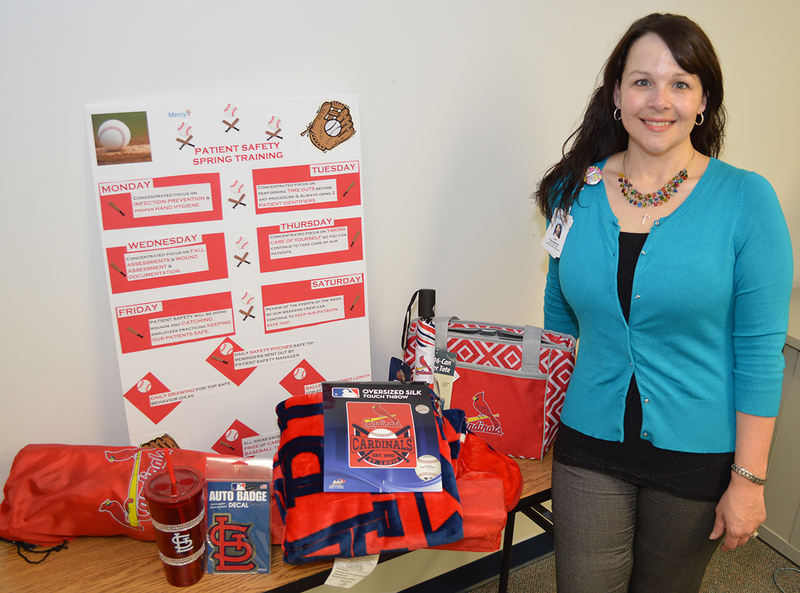 To celebrate, Mercy Hospital Jefferson is focusing on a particular patient safety behavior each day during a weeklong “Safety Spring Training.” Each baseball-themed day is concentrated on a different area of patient safety. For example, today (“Fever Pitch”), is centered on infection prevention and proper hand hygiene. Mercy Hospital Jefferson will continue to implement the behaviors emphasized this week all year. Patient safety initiatives, such as manager attendance of Patient Safety University, daily huddles to address safety concerns and monthly “Good Catch” awards, have been implemented throughout the hospital. The Congressional Budget Office released cost estimates of enacting the proposed American Health Care Act. According to the report, the legislation would reduce federal deficits by $337 billion from 2017-2026, and 24 million people would lose health insurance coverage by the end of 2026. MHA has expressed its concerns to Wisconsin Physicians Services regarding a recent change in policy affecting coverage of hospital-based sleep studies. WPS is the Medicare administrative contractor for Missouri and has the authority to set policy on the services that Medicare will cover. On Feb. 16, WPS implemented a restrictive policy requiring hospitals to obtain additional accreditations to continue billing Medicare for sleep studies. MHA’s concern about the lack of adequate notice and education, and the impact the policy will have on patient access, was expressed in a letter to WPS. MHA encourages its members to ask WPS to reconsider the policy. The MO HealthNet Provider Education Unit has scheduled claims filing workshops for several MO HealthNet programs, including physicians and clinic services, behavioral health, applied behavioral analysis, ambulance, dental and durable medical equipment. The workshops will be held in Jefferson City, although webinar options are available for the behavioral health and applied behavioral analysis sessions. Registration is required. The comment period for the Occupational Safety and Health Administration’s request for information for prevention of workplace violence in health care and social assistance closes Thursday, April 6. The RFI, released Dec. 7, 2016, has received more than 40 comments from health care and social assistance providers. OSHA requests provider input to evaluate the need for stronger regulatory guidance. Comments may be submitted online. An outreach and education webinar for participants in the Inpatient Psychiatric Facility Quality Reporting Program is scheduled at 1 p.m. Tuesday, March 21. The webinar, titled “Potential Measures for the IPFQR Program and the Pre-Rule Making Process,” will provide an overview of the measure development process. Registration is required. The Centers for Medicare & Medicaid Services recently updated the extraordinary circumstances extensions/exemption policy clarification questions and answers document for calendar year 2016 electronic clinical quality measures reporting. Deadline for submitting ECE requests related to CY 2016 eCQM reporting is Saturday, April 1. Instructions for submission are available on QualityNet. Hospitals that have previously submitted an ECE request for CY 2016 eCQM reporting and were initially denied may submit a new ECE request with the most current supporting documentation for CY 2016 reporting. All supporting documentation must be provided at the time the ECE request form is submitted. The Institute for Healthcare Improvement and the National Patient Safety Foundation have announced their plans to merge, effective Monday, May 1. The organizations recognize that patient safety is a public health issue that needs fresh, robust approaches and constant focus. Steven C. Bjelich, President and CEO of Saint Francis Healthcare System in Cape Girardeau, has announced his retirement, effective Sept. 1. He has served as President and CEO since July 1999. Pending approval, Maryann Reese will succeed Bjelich as President and CEO upon his retirement. Reese has served as Executive Vice President and Chief Operating Officer since August 2015. Before that, she served as CEO of St. Elizabeth’s Hospital in Belleville, Ill. A list of CEO changes is available online. The week is National Patient Safety Week. An estimated 234 million surgical operations are performed globally every year.